Life According to Steph: TWTW - it was the June-iest of weekends. Friday night was scintillating as always. Reading, weights, hanging with dogs, grocery delivery, dinner a la MFD. This is 38. Saturday Farmer's Market and errands. At market I got bone broth to add to the dogs' food (great for their joints), chicken breast, spring mix, spinach, peas, gouda, eggs, and a freaking amazing peach cardamom cake with almond streusel. In the afternoon I deadheaded flowers and cleaned out my car. You know, the stuff you don't want to do but you have to do. I did find our marriage certificate paperwork in the car...we'll be married five years in September. Whoops. Saturday afternoon we attended the annual bike race party at Heather & DJ's. 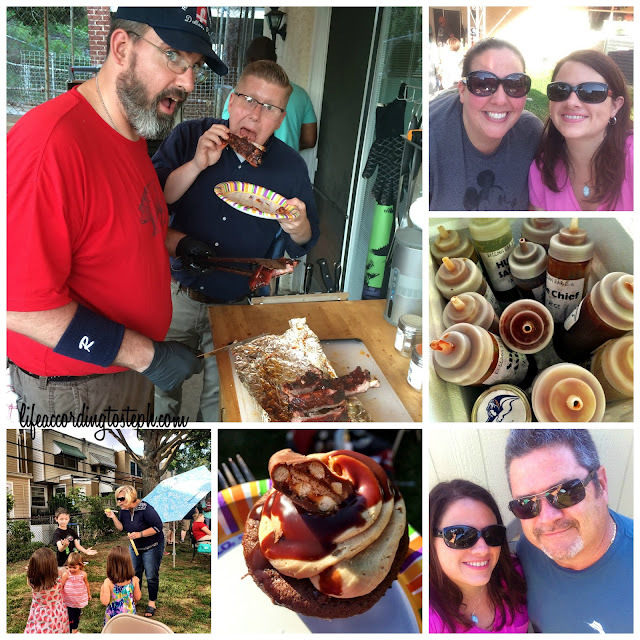 Great food including DJ's awesome homemade barbecue sauce line and one of the best cupcakes I've ever eaten in my life. It was a wonderful day to be outside and catch up with some old friends of ours and my parents. Sunday I did the usual: change sheets, wash sheets and towels, blog, read...I also enjoyed coffee in my new mug from Carol, sorted through my sunblock to see what I need to buy for vacation, did a little bit of work work, and hung out with los perros in blissful silence - no TV or radio. Sunday afternoon we had a delicious dinner at Stephen & Aubrey's including strawberry pie, which I love. I also tried corn on the cob (cut off the cob of course) with Old Bay on the recommendation of Aub's mom. It was delicious. It was a lovely afternoon to sit outside and their backyard is awesome. Weekly food prep: Breakfasts are egg muffins with spinach, ham, and cheese. Since I am a nice wife I made some for MFD also. Lunches are turkey over spring mix with veggies; snacks are strawberries, peppers and peas, and greek yogurt; dinners are a grilled chicken thighs and veggies and turkey breast with steamed veggies. Food for parties: pasta salad with mozzarella, tomatoes, EVOO, and pesto for the barbecue Saturday, veggie pizzas for Stephen & Aubrey's on Sunday. Tomorrow! 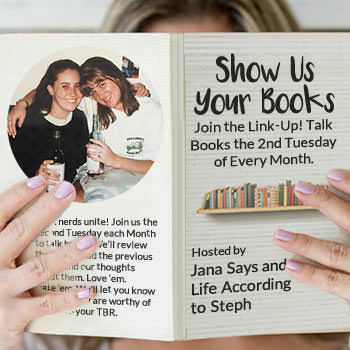 It's my favorite day of the month - the Show Us Your Books Linkup with me & Jana. Can't wait to see what you've been reading. OMG that veggie pizza looks amazing!! Loving all that fresh food from the market. The mug is perfect, and so true!! Looks like some great outdoor fun, with good company! our damn market isn't open yet and it's freaking june already. come on canadian weather, get it together!!! the peach cake sounds amazing!! better than my breakfast, haha. i am the worst about finding things in places they don't belong... i totally found something to do with immigration shoved into my planner (with a thousand other pieces of paper) like the day before i needed it, whoops. the veggie pizzas look amazing. and i always love the expressions on the dogs faces, hilarious! 1. What is deadheading flowers? 2. Are all those bottles different kinds of bbq sauce?! Yummmm! 3. I don't even know what I will find when I clean out my car... I should get on that. Silence with los perros is definitely blissful. Looks like a fabulous weekend, lady! 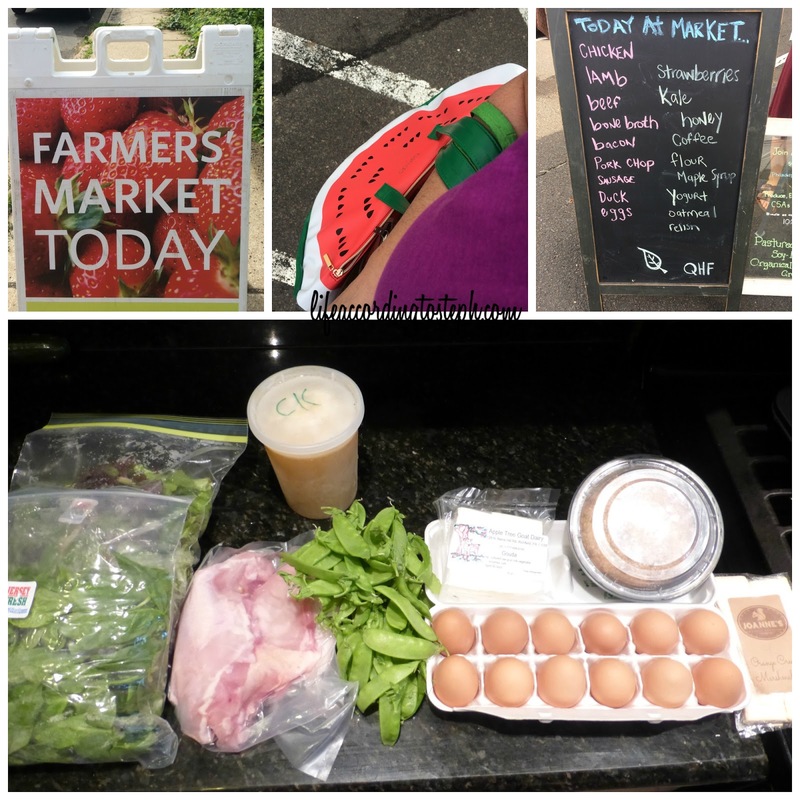 I love the farmer's market and all the food looks amazing!!! That strawberry pie looks delish and I will now have to try COTC (on the cob for me!) with Old Bay. All that food is making me really hungry right now. 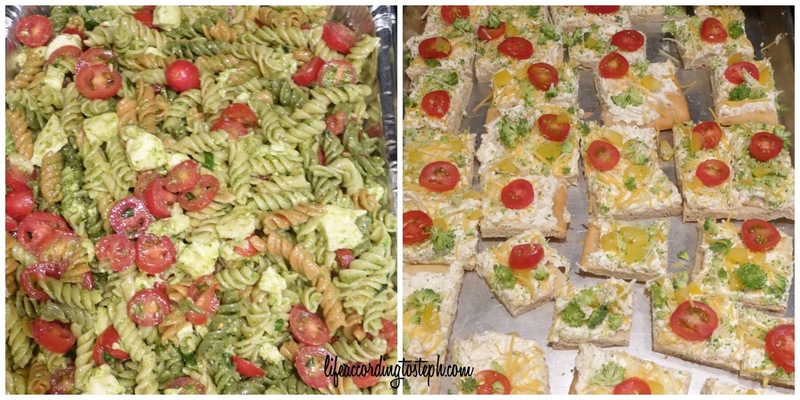 The pasta salad with the pesto looks delicious! I love pesto but I never really make it because my husband hates it. On another note, I really love your hair color! I made the mistake of going lighter for the summer and I hate it. I have dark eyebrows and the lighter hair just does not look good. Going back to dark! I just realized that all of Sunday was silent for us too - no tv no radio. It was amazing! And I love the pasta salad, I made one last week - but, I may have to start making them weekly, because SUMMER. That all sounds so nice- productive and busy but no pressure or nonsense! I'm not sure if that's Gus or Geege in the bottom right of that collage but OMIGOD! That. Face. Let's plan for you to come to this side of the pond and we'll have a Wexler Girls/SMD breakfast at the Collingswood Farmer's Market (Tortilla Press!!) on Saturday morning! I haven't been there but once because of PJ's soccer schedule and need a fix! 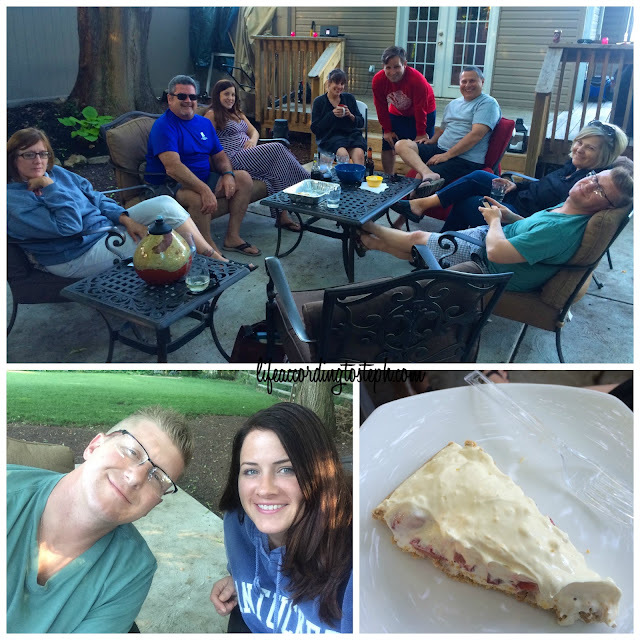 Love the back deck picture with everyone's big smiles while they congregate. If sitting outside with pals chatting and sipping wine isn't the key to summer, I'm not sure what is. Again, astounded by the amount of work you manage to get done! And the watermelon bag is oh so cute at the Farmer's market! broth for the dogs? you are good to them. they are lucky, well, dogs. that homemade barbeque sauce sounds awesome. THANK YOU FOR THE SHOW US YOUR BOOKS REMINDER!! working on a post RIGHT NOW. thank you. thank you. Love all your farmer market finds!!! I think Old Bay seasoning on corn on the cob would be amazing!!! Yum!!!! And strawberry pie...oh how I love thee!!!! I miss living in PA and it being a staple everywhere in the summer. I dont think people even know what strawberry pie is down here. All the sads. Looks like a pretty good weekend to me! I need a muffin tray that has squares!! Good food and great company- two of my favorite things! I like Old Bay on just about everything, and those ribs look divine. Sunday was silent in these parts too. It's so refreshing to disconnect sometimes. Nice weekend producticity and fun! i really need to make it to our Farmer's market soon...You always get such great stuff. Is that BBQ sauce on the cupcake? Your Sat and Sunday both sound like a good time with friends and family. Old Bay is my favorite seasoning after Buffalo Wild Wings salt and vinegar so yum combining it with corn on the cob. If I had half your weekend motivation, I'd be unstoppable. Wow, already got food ready for a party this coming weekend. You are prepared! I love a good farmer's market. We signed up for a CSA this summer and I had farm-fresh arugula salad for lunch today. So peppery and wonderful. The chicken from the farm is also the juiciest, even the breast part. Can't wait for the linkup tomorrow! Corn on the cob w/ old bay?! YUM- I need to remember that and try it out! You rock the heck outta' weekends- you always get so much done and I feel like a waste of life ;) Maybe I can make this week productive- cheers! What a fun weekend! I'm drooling over this post. Yum yum yum all around! I have spent a lot of Friday nights the same way, since my early twenties. I was never a club/party/bar person. Old Bay is delicious on potatoes too, Tyson made some last night. 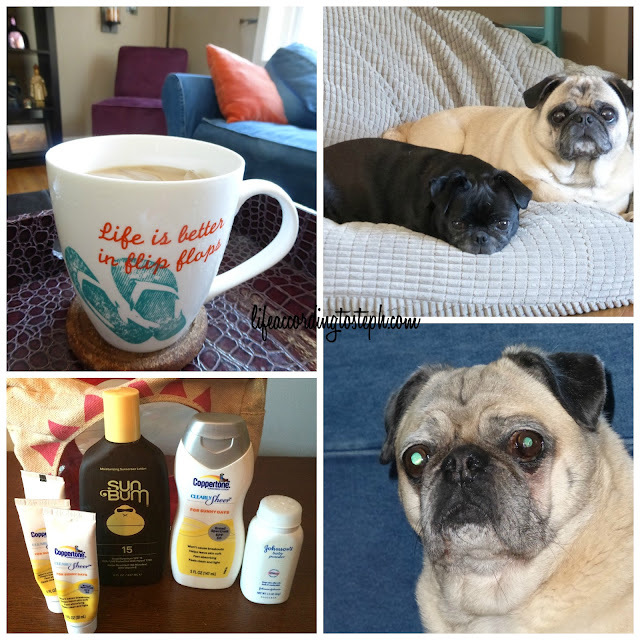 Do you like the Coppertone Sheer Sunscreen, I was thinking about trying it on my face? I LOOOVE the Farmer's Market! Such a fun way to spend a Saturday or Sunday morning! Awesome weekend! All of your food looks delicious as always. Matt's been making our corn on the cob with Old Bay lately and it's delicious! The week was worth having just for the best cupcake ever! That cupcake looks amazing and makes me want a cupcake oh so badly. Also, I love that you found your marriage certificate. You win. ha about finding the certificate! and boo for having to adult. but hey, how else would these things get done? gotta love any opportunity to snuggle with pups. So much good food!!! I love that you spend your weekends with so many people you love and still find the time to tend to flowers and your house. You pack it in on a weekend!